Luby’s Sausage Steak is a sausage steak that is topped with melted cheddar cheese, crisp bacon, and scallions. Sausage hasn’t been served for breakfast like this before. If you didn’t know, Luby’s Cafeteria serves breakfast, and their sausage steak is one of my favorite menu items that they serve for breakfast. This recipe is easy to make, and makes a great weekend breakfast. A pound of your favorite ground sausage and a few other ingredients, and you can prepare breakfast for a family or even for yourself, and reheat during the week. The beef broth is our secret ingredient here, it helps make the sausage more steak-like and keeps the meat nice and juicy. Did you know you can have steak for breakfast, you can have a sausage steak. Divide ground sausage into approximately six patties. Shape the patties into oblong pieces. Place sausage into a 9 x 13 inch baking dish. Cover the bottom of the dish with beef broth. Broil the sausage patties in the oven. Follow the directions on your oven's broiler, on high this may only take 10-13 minutes. Make sure the sausage is completely done. 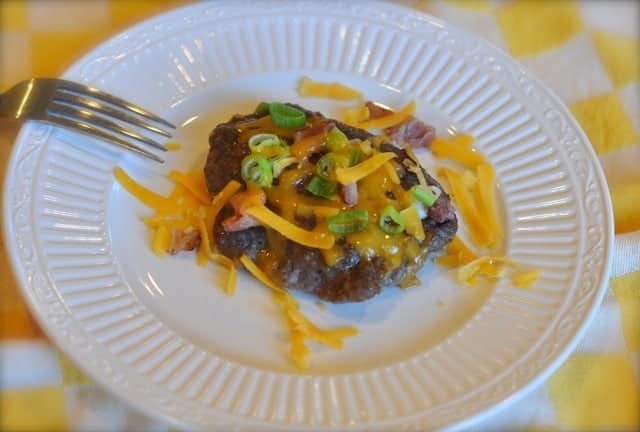 Top with cheese, green onions, and bacon, place sausage steaks back into the oven for approximately one or two minutes to allow the cheese to melt. What a super read first thing on a Monday morning. I love anything Luby’s!!!!!!!!!!!! Wish we had one close but folks like you let us do our best to duplicate. My most requested recipe is Luby’s carrot soufflé. 2nd place isn’t even close! My Luby’s never makes this. I go there about once a week, they are close to my office. Your only solution is to move your office! Oh goodness no 😉 There is one near my house too, but when I am home I generally cook. So many recipes to write, so little time. Does the Luby’s near your home use the carrot recipe? Hard to believe they have dropped this item. It is to die for, imho! The only place where I have had a similar recipe is at Piccadilly cafeteria. I am not saying they dropped the menu item, the two Luby’s that I go to, don’t serve this. It says boil in broth in oven then it says to broil. Do you do both?